Outdoor road biking down the San Gabriel or Los Angeles/Rio Hondo riverbeds. This activity is primarily for advanced riders however those wanting to introduce themselves at a slower pace are welcome. Beginner mileage 10-20miles. Advance mileage 30-100miles. Check calendar for upcoming rides! 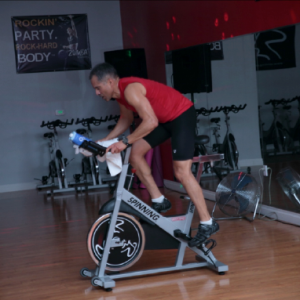 Indoor Cycling commonly referred to as “spinning” using Keiser, Schwinn, or Johnny G indoor bikes set to the tone of inspiring background music. Sprints, hills, and flats practiced and honed for both beginners wanting to try this type of aerobic activity and advanced indoor cyclists. Cycling shoes preferred. Check my calendar for dates, times and locations.